Special Places! Explore a special place with this free fold-it! • This fold-its can be used in several different ways. It could be displayed on an interactive white board and used to stimulate discussion. 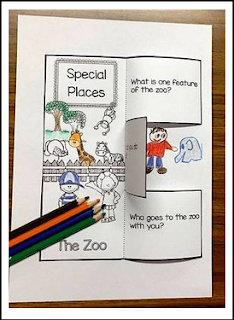 • Students can use the fold-it to record their thinking about a special place: the zoo. • This task can be differentiated by asking students to either draw a picture/ write some words/ tell about the pictures, or the teacher can scribe for a student and record the child’s words.